When the English seized the city from the Dutch in 1664, King Charles II changed the name to New York but the policy of tolerance in support of trade remained the same. Dutch families on Manhattan, Long Island, and throughout the Hudson River Valley retained their property, their rights as citizens, and even their positions in the colonial government when the first English Governor, Richard Nicolls, took command on the 6th of September 1664. Part of the process of changing from Dutch to English rule was confirming property ownership. 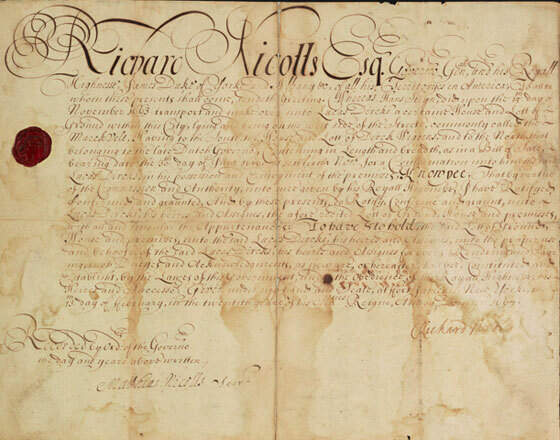 This document confirms Lucas Dircks title to what is now 21 Broadway - a property he acquired under Dutch rule in 1663. Nicolls, Richard, 1624-1672, ADS (New York, Feb. 13, 1667), 2 pages.